"THE IMAGICAL WORLD OF BOSSONS"
Published by: Collector Books, PO Box 3009, Paducah, KY 42002-3009. Yearly issues of Schroeder's contain detailed information which Don has authored. Each highly respected guide contains brief historical sketches about Bossons productions and limited price lists for new/perfect condition Bossons..
"Antiques & Collectibles Price Guide, 1995"
The Books art available at many bookstores and libraries in the U.S.
VII. With viewing upon request, new discoveries of Bossons, especially unusual prototypes never released to the market, can be viewed in the exclusive slide show by Dr. Hardisty. There seems to be no end to Bossons discoveries. Just look at this delightful new piece submitted by Dr. Don Hardisty. 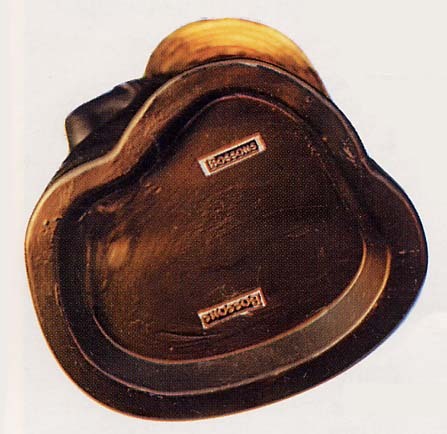 According to information submitted with the photographs seen here, it is speculated that four experimental examples of the rare African Drummer were produced. Hardisty reports that the African Drummer resembles "very closely the style and quality finishes of the Jazz Figures which were modeled by Colin Melbourne around 1959". 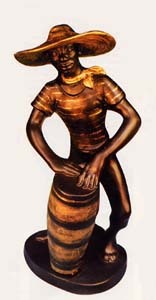 The African Drummer is 10" high and 4-1/2" at the widest portion of the base. The piece is produced in fired porcelain with painting under the glaze. The coloring of the entire figure excluding the highlighted trims, including the base and skin is "Ivory Black". The highlighting is gold leaf and the figure has not been shellacked or varnished. The golden glow effect over the figure in the photo is due to photography lighting. Unlike most fired porcelain products, the African Drummer does not appear to be hollowed out. This is unusual for fired porcelain where air spaces usually allow for air movement and adequate heating and cooling. According to Hardisty, this may account for the only defect in the almost mint condition piece, a crack on the left arm. In the Imagical world of Bossons books, there is a picture of the African Drummer. It is located in Book I, Page 22. See the photo lower right, and look on the shelf above Mr. Bossons secretary's head.